Every day, all day we [at the Alzheimer's Association] talk about our 24/7 Helpline (800.272.3900). I literally just finished writing an oped and included a part about our 24/7 Helpline. But, if you don't work for the Association and are not on our Board of Directors do you know what we mean? I am sure you are rolling your eyes, yea yea it is a call-in service if you need help. Well, sort of. I try to put myself in our constituent shoes - would I attend a support group? What would get me to an advocacy day? Would I call an 800# for help? For some reason the last question has been top of mind lately. Our Helpline is truly just a phone call. It isn't a process or an application, there are no qualifying questions or information we will demand from you, and it is FREE! All you have to do is pick up the phone. You don't even have to have a question. To be perfectly honest, a large majority of our Helpline calls start out that way - we just found out someone we love has Alzheimer's and we don't know where to start. We just received a diagnosis, what now? There is something happening with my loved one, is it Alzheimer's? And what is the diagnosis process? We need professional caregivers, where can we find help? I think it is time for a nursing home, how? My loved one refuses to bathe, I don't know what to do? Last week my loved one left the house and we couldn't find her for an hour - how can we keep her safe? I am tired and stressed out, I just needed to say that out loud to someone. She is seeing spiders on the wall and gets really angry when I tell her there aren't spiders on the wall. I want more information about clinical trials. I have early-stage Alzheimer's what can we do to get my family ready? How do I talk to my boss about being a caregiver? While that is a pretty short list of questions we answer on any given day, I hope it gives you an idea of the help available. Our 24/7 Helpline is a safe and confidential service to help through your journey with Alzheimer's. We are here to help,24/7. COMMUNITY WORKSHOP! We are hosting community workshops in our Charleston and Parkersburg offices next week, click here for details! VOTE NOW! Our celebrity dancers are hard at work preparing for Dancing Through Time on March 22 - you can vote online for your favorite dancing duo! Click here to vote or buy tickets to attend the event! Directions: Pour heavy cream and vanilla into sauce pan and heat over medium heat, stirring constantly. Once it begins to bubble remove from heat and allow to cool for 15 minutes. 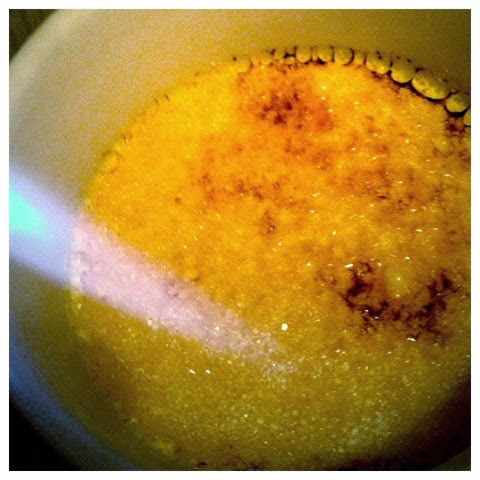 In the mean time whip together sugar and eggs until the mixture is a bright sunny yellow. After the cream and vanilla mixture cools, slowly pour into the egg mixture while whipping with a hand blender or kitchen aid mixer. Be careful not to scramble your eggs. Whip the mixture together until all is combined and there is a layer of foam on top. Place your ramekins in a baking dish, pour the egg/cream mixture evenly into ramekins. Fill the baking dish with hot water so the water comes halfway up the sides. Bake at 325 for 40 minutes or they are just a little jiggly in the middle. Allow them to cool in the fridge for at least 2 hours. When you are ready to serve coat the top of the creme brulee with a thin layer of sugar and either place under the broiler for 5 minutes at high heat or torch with a kitchen burner (this is W's job!) Then dive in for a spoonful of love!